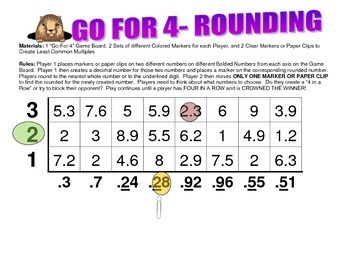 A fun and exciting game that reinforces rounding decimal numbers. Rules: Player 1 places markers or paper clips on two different numbers on different Bolded Numbers from each axis on the Game Board. Player 1 then creates a decimal number for those two numbers and places a marker on the corresponding rounded number. 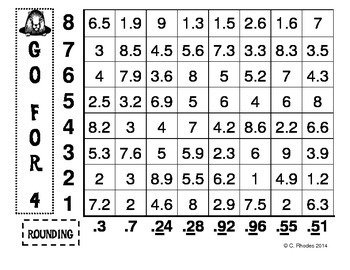 Players round to the nearest whole number or to the underlined digit. Player 2 then moves ONLY ONE MARKER OR PAPER CLIP to find the rounded for the newly created number. Players need to think about what numbers to choose. Do they create a “4 in a Row” or try to block their opponent? Play continues until a player has FOUR IN A ROW and is CROWNED THE WINNER!